The water that leaves our treatment works and passes through our distribution network is virtually free of lead. However, in some areas the pipe that takes water to a home and the internal plumbing may be made of lead. Very small amounts of lead from this pipework can dissolve into the water as it passes through and/or stands in the pipes and this can result in elevated concentrations of lead in the drinking water. The longer the water is in contact with the lead pipes the higher the lead concentration in the water is likely to be. The current standard for lead in drinking water is 10µg/l, which came into force on 25th December 2013. At our treatment works that supply areas where lead pipework is prevalent we have treatment that helps to reduce the amount of lead that dissolves into the water. This treatment has been very successful and means that over 98% of properties are compliant with the 10µg/l standard. In addition to this we are undertaking programmes of targeted replacement or lining of the lead pipes in our network with the backing of the Drinking Water Inspectorate (DWI) and our regulator, Ofwat. Awareness of lead and its impact on health has increased in recent years and it appears that it has most affect on foetuses and young children. This knowledge has led to campaigns to significantly reduce lead found in the environment, such as unleaded petrol and lead free paints. It is therefore sensible to reduce exposure to lead to as little as possible and so reducing lead in drinking water is another step towards this goal. Prior to 1970, lead was commonly used for pipework in and around properties because it was flexible yet robust. However, the use of lead pipework was banned in 1969, so properties built since this time are highly unlikely to contain lead pipework. If you want to check the pipework in your property the best place to start is where the water supply enters you house. This is normally in the kitchen but can be elsewhere and is typically where the internal stopcock is located. Lead pipes are normally dark grey in colour but if gently scraped shiny silver coloured marks appear. Most houses have been re-plumbed above ground level but there may still be lead pipework in the ground under your property. This pipework is the responsibility of the property owner. If you establish that your water supply does pass through lead pipework it is advisable to run the water for a minute before using it for drinking or cooking purposes, especially after the water has been standing for a long time e.g. first thing in the morning. The water that is run off can be used for washing or plant watering purposes. 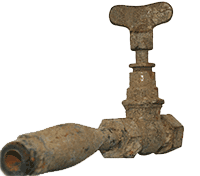 If you decide to replace this pipework Affinity Water will line or replace any lead pipework between the water main and the edge of your property (known as the communications pipe) free of charge, as long as it is on a like for like basis. If the pipe size needs to be changed and/or a different connection location is required, charges may apply. Once you have lined or replaced the lead pipework in your property please contact us to inform us that you have carried out this work and you would like us to line/replace the communications pipe if it is found to be lead. We will then arrange for the work to be carried out and keep you informed of our progress. Following any plumbing work on lead pipes before first use you should run your cold water mains tap at a steady rate for 10 minutes, for the next three days run the kitchen tap for 2 minutes prior to the first use. If you would like further information about lead in the water supply please contact us. A member of the water quality team will contact you and, if appropriate, will arrange for a sample to be taken of your drinking water to determine the level of lead in it. Alternatively you can contact your Local Authority’s Environmental Health Office.